But He gives more grace. Therefore He says: “God resists the proud, But gives grace to the humble.” (James 4:6 NKJV). And you shall remember that the Lord your God led you all the way these forty years in the wilderness, to humble you and test you, to know what was in your heart, whether you would keep His commandments or not (Deuteronomy 8:2 NKJV). If My people who are called by My name will humble themselves, and pray and seek My face, and turn from their wicked ways, then I will hear from heaven, and will forgive their sin and heal their land (2 Chronicles 7:14 NKJV). You were sorry and humbled yourself before God when you heard his words against this city and its people. You humbled yourself and tore your clothing in despair and wept before me in repentance. And I have indeed heard you, says the Lord (2 Chronicles 34:27 NLT). When they cast you down, and you say, ‘Exaltation will come!’ Then He will save the humble person (Job 22:29 NKJV). When He avenges blood, He remembers them; He does not forget the cry of the humble (Psalms 9:12 NKJV). Arise, O Lord! O God, lift up Your hand! Do not forget the humble (Psalms 10:12 NKJV). 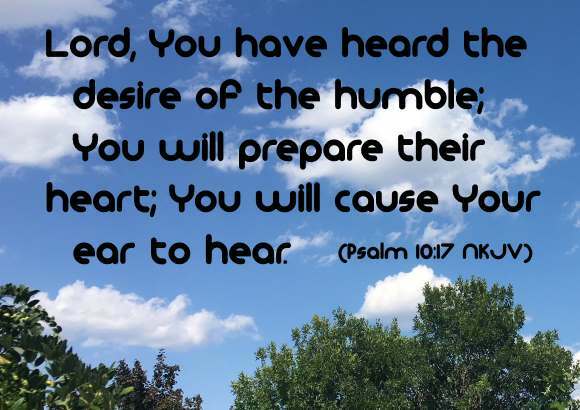 Lord, You have heard the desire of the humble; You will prepare their heart; You will cause Your ear to hear, (Psalm 10:17 NKJV). My soul shall make its boast in the Lord; The humble shall hear of it and be glad (Psalm 34:2 NKJV). So do this, my son, and deliver yourself; For you have come into the hand of your friend: Go and humble yourself; Plead with your friend (Proverbs 6:3 NKJV). Better it is to be of an humble spirit with the lowly, than to divide the spoil with the proud (Proverbs 16:19). A man’s pride will bring him low, But the humble in spirit will retain honor (Proverbs 29:23 NKJV). Whosoever therefore shall humble himself as this little child, the same is greatest in the kingdom of heaven (Matthew 18:4). 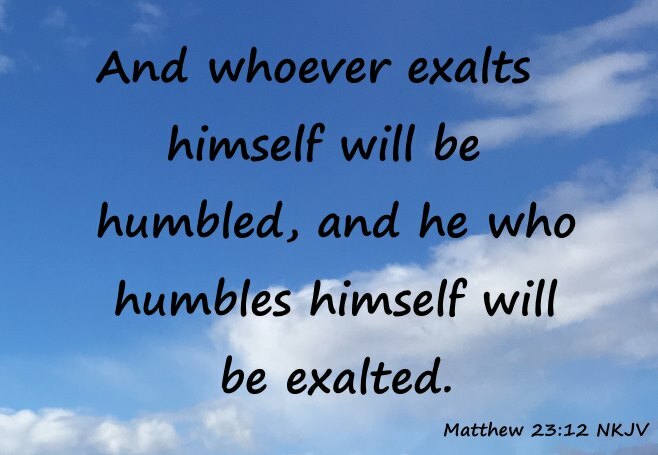 And whoever exalts himself will be humbled, and he who humbles himself will be exalted (Matthew 23:12 NKJV). And being found in fashion as a man, he humbled himself, and became obedient unto death, even the death of the cross (Philippians 2:8). Put on therefore, as the elect of God, holy and beloved, bowels of mercies, kindness, humbleness of mind, meekness, longsuffering; Forbearing one another, and forgiving one another, if any man have a quarrel against any: even as Christ forgave you, so also do ye. And above all these things put on charity, which is the bond of perfectness (Colossians 3:12,13,14). Humble yourselves in the sight of the Lord, and he shall lift you up (James 4:10). Likewise, you who are younger, be subject to the elders. Clothe yourselves, all of you, with humility toward one another, for “God opposes the proud but gives grace to the humble.” (1 Peter 5:5 ESV). Humble yourselves therefore under the mighty hand of God, that he may exalt you in due time (1 Peter 5:6).